If you've ever taken a phenomenal spin class, you know that the best instructors have a kind of magic to them—they're bursting with energy, encouraging without being cloying or pushy, and somehow manage to transform the dark, sweaty studio into a kind of communal therapy session. As such, it should come as no surprise that the top cycling studios don't choose just anyone to lead their classes. Leading rides for companies like SoulCycle, Flywheel, and Peloton requires committing to an intense selection process that includes several hours of auditions and interviews—and that's not even to mention all the work that goes into the job if you're lucky enough to make the cut. 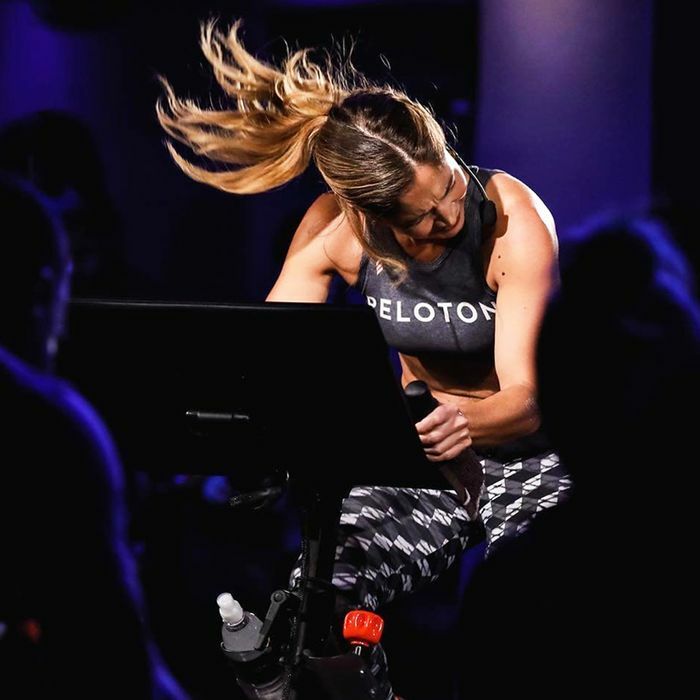 For more insight on what it's really like to become a cycling instructor, we deferred to Emma Lovewell, an NYC-based fitness model, dancer, and Peloton instructor—a particularly coveted title since Peloton streams its classes to thousands of users across the world and there only 12 instructors with the brand who get to call this global reach their own. Below she gives us an inside peek at how her gig came to be. "I had actually worked with Peloton as a model in its first commercial in 2012. At the time, I was a professional dancer and a new fitness instructor and Peloton was a new company. That was my first introduction to the company. I went on to teach indoor cycling, Pilates, personal training, cardio dance, etc., for many years, but I always had my eye on Peloton because the company was and still is one of the most innovative companies I know. I had moved to California about a year ago and was working in fitness out there, but I had this feeling I should contact Peloton and see what kinds of opportunities there might be. I just loved the idea of being able to teach fitness to thousands of people." "What I think is necessary to be a great fitness instructor is fitness education, performance, empathy, and a love for music. So learning how to be an instructor for me was getting the necessary education and certifications and practice. Lots and lots of practice. I was a professional dancer, as I had said, and I was a DJ for a period of time as well. So I love music and I love moving to music. I had the performance aspect down because of that. So for me it was learning how to speak to large rooms without getting nervous." "Auditioning for Peloton was exhilarating! It was my first time teaching indoor cycling in front of a camera, well, four cameras. I was asked to teach 10 minutes of a ride and coach to a camera with no one else in the room. That audition is a huge part of the hiring process: do you connect on camera or fall flat? Are you engaging? How's your form and instruction? "But what was more surprising for me was what happened after that audition. There is so much that happens outside of that studio. I had maybe five hours of interviews and really got to learn what this job was all about. From marketing meetings and collaborating with the social media team to meeting weekly with a producer to talk about your 'show' and creating class plans, boutique collaborations, photo shoots, scheduling showroom appearances across the country, and the list goes on! There is so much more that goes into this job than teaching a class. And that is what makes this job so exciting and unlike any other fitness job out there." "[A lot of it] is learning how to curate a playlist that is motivating and connecting with people to find out what they are going through and how I can help. You have to know someone to be able to help them. And as an instructor, you will have all kinds of people with all different stories who are there for many different reasons."